Bees Ferry Animal Hospital is home to one of the largest, licensed veterinary teams in the state. Our staff is comprised of veterinarians (DVMs), veterinary technicians (LVTs) and nursing assistants who are committed to helping pets and the people who love them most. Education plays a crucial role in that, and all of our staff members participate in weekly training sessions to maintain high quality service standards. Please take a moment to learn more about our talented support staff. Marshall joined the Bees Ferry team in 2016 as our Hospital Administrator. He has worked in veterinary medicine since 1997 and is a Licensed Veterinary Technician and a Certified Veterinary Practice Manager. He is responsible for business operations and staff development. His goal is to make sure that our patients and pet owners always have a positive experience. Additionally, Marshall serves on the state veterinary board and also speaks at veterinary conferences. Marshall is also keenly interested in exotic birds and is a Certified Avian Specialist. When Marshall isn’t working, he enjoys cooking, indulging in Chareston’s restaurant scene, traveling and yoga. Jimmy has been with Bees Ferry Veterinary Hospital since 1996. He is an excellent nurse and serves as our Senior Veterinary Technician. Jimmy's professional areas of interest include anesthesia, dentistry and radiology. When he isn’t working, Jimmy enjoys fishing, watching TV with his fur kids and spending time with his fiance, Jenni. The two actually met at Bees Ferry while Jenni was interning as a pharmacy student. Kaylyn joined the Bees Ferry team as a Veterinary Assistant, and she has advanced to veterinary technician. Kaylyn is currently working on an Associates in Veterinary Technology from Penn Foster College. She regularly assists with charitable fundraising efforts and is the director of our Bees Ferry Rescues program. In addition to charity work, Kaylyn loves her husband Jesse, Ford Mustangs, art, photography and, of course, animals. As a Veterinary Technician, Hillary is involved with all aspects of nursing care including post-op recovery. She earned her Associates in Veterinary Technology at Penn Foster College. Having been with Bees Ferry since 2010, she is an integral part of our hospital. When Hillary isn’t working, she enjoys photography, crocheting, painting, collecting and spending time with family. Suzanne is a Licensed Veterinary Technician that has been with Bees Ferry since 2012. She has a big heart, and her mission is to keep our patients as pain free as possible. In addition to excellent patient care, Suzanne has a strong commitment to people and can often be found taking care of the reception area. Always eager to help, Suzanne is available to answer questions and provide guidance for at-home care. When Suzanne isn’t working, you can find her her camping, watching movies or cheering on her children at various sporting events. Sharon joined the Bees Ferry team in 2008 as our Kennel and Daycare Manager. She invests a great deal of time and effort into ensuring that all of our guests are clean, comfortable and entertained. Sharon’s “regulars” love her so much that they usually don’t want to go home! When Sharon isn’t caring for pets at Bees Ferry, she enjoys gardening and spending time with her own furry and feathered family members. Jean is our Client Care Manager. She assists with boarding guests and ensures that all of our patients and pet owners are well taken care of while waiting to see a doctor. She’s there to lend a hand or hold a leash and often helps pet owners to their car. Jean loves art and meeting new people, and she spends much of her free time reading and crafting. Emily joined the Bees Ferry team in 2014 as a Kennel Assistant. She has since been trained in multiple roles. Her loyalty to animals is unparalleled. Emily has helped Kaylyn with our Bees Ferry Rescues program by spear-heading canine adoptions. She regularly fosters dogs that are seeking fur-ever homes. She enjoys caring for fosters, playing with her own pets, spending time with her daughter, camping and playing soccer. Courteney joined the Bees Ferry team in 2015 as a Veterinary Assistant. She enjoys all aspects of veterinary medicine and is particularly interested in exotic animals and rare diseases. And when she isn’t conducting professional research, Courteney enjoys studying history. Becky joined the Bees Ferry team in January of 2016 as a Veterinary Assistant, and she became a Licensed Veterinary Technician in August of the same year. When Becky isn’t caring for our patients, she’s usually pet sitting or spending time with her own furry family members. Becky also enjoys crocheting, photography and a variety of outdoor activities. Matt joined the Bees Ferry team well over a decade ago and was with us ten years before heading off to Clemson. At Clemson, he studied Wildlife and Fisheries Biology. He returned to our team in May of 2016 as a Veterinary Assistant. He has a profound interest in the outdoors. Matt and his wife also enjoy Clemson Football and spending time with their own dogs. Katie joined the Bees Ferry team in December, 2016. She keeps our front desk running smoothly and thoroughly enjoys meeting new people and pets. Katie has a Bachelor’s of Arts and loves cooking. She used to work in a high end cooking store, so her kitchen is well stocked with gadgets! Katie also enjoys spending time with her husband, Andrew, and cheering on the Carolina Gamecocks. Amanda started with Bees Ferry back in 2007 as an assistant. She left to start a family and found her way back to us in September 2018. You can find Amanda at the care coordinator station as soon as you walk in or holding your pooch during an exam when she is assisting. She is from Lexington, Kentucky, has a Bachelor of Science degree in biology from Georgetown College. Amanda enjoys playing soccer with her family and going to the beach. Two dogs, Dobby and Blue, and one cat named Gus. Miriam joined the Bees Ferry Family in September, 2017, and she spends most of her time making sure that our boarding and daycare pets are having fun. She aspires to attend veterinary technology school, and enjoys spending time with her husband, Aaron, playing volleyball and swimming in her spare time. Hannah joined the Bees Ferry team in March, 2018 as a Veterinary Assistant. She has a Bachelor’s in Animal Behavior and had some awesome experiences as a student, including working with a gorilla. Hannah and her fiancé recently relocated to Charleston and are loving the weather here. They have 1 cat, Bagheera, 1 bunny, Lilly, and one bearded dragon named Dragon. She is a fan of the Buffalo Bills and the band, Imagine Dragons. Tracie joined our team in June of 2016 and is one of the hearts of our kennel/daycare. She absolutely loves taking care of the “babies” as she calls them. She takes pride in knowing their stories, their needs and what each pet enjoys or doesn’t enjoy. She will make sure that your pet has a fantastic time when staying in our kennel and daycare! Nick joined the Bees Ferry team in March, 2018 as a kennel attendant and Veterinary Assistant. He previously worked in a doggy daycare environment and is excited to expand upon his abilities to serve animals with us. Some of his hobbies include video games and painting. Jenna joined the Bees Ferry family in January, 2018 as a Veterinary Technician student extern and ended up coming on board fully soon thereafter. Jenna graduated from veterinary technology school in May of 2018 and will soon be a Licensed Veterinary Technician. She is a talented Veterinary Technician and is grateful for her new career path. She has two dogs, Cowgirl and Diesel. She is a fan of the USC Gamecocks and country music. Lauren joined our team in February, 2018. She is a graduated from Trident Technical College’s Veterinary Technology program a few years ago and is a Licensed Veterinary Technician. Lauren has a special interest in animal behavior and enjoys offering pet sitting services outside of her work with us. Lauren has three dogs, Nala, Remi and Lieutenant as well as one cat, Hokie. Haylee joined our team in June of 2018 in a dual role of facilitating care both as a Care Coordinator and attending the Kennel/Daycare. She is an aspiring Veterinary Technician with plans to begin the vet tech program at Trident Technical College very soon. Chrissy joined Bees Ferry in June of 2018. She is a Licensed Veterinary Technician who earned her degree from Medaille College in Buffalo, New York. Chrissy moved to Charleston in 2008 and doesn't miss the New York snow at all! Even after all these years, she still looks forward each day to working with animals and helping their families be educated about their care. Chrissy's patience and compassion are part of why she is a wonderful veterinary nurse. Outside of work she enjoys movies and reading. Iliana came to BFVH in June of 2018 to pursue her career as a Veterinary Technician. She will be attending Trident’s veterinary technology program in the fall of 2019. Iliana is interested in the possibility of specializing in large exotic animals such as zoo medicine. Outside of work she enjoys jet skiing, hiking and swimming. BreAnna came to Bees Ferry in 2017 as a care coordinator and kennel attendant. She left for a little bit, but came back in November 2018. BreAnna is one of our wonderful care coordinators and works tirelessly to support our rescues. She worked in the childcare field for 11 years before following her true passion and finding Bees Ferry. When BreAnna isn’t taking care of our clients, she enjoys baking and has a zealous passion for fundraising. Sarah started at Bees Ferry in 2011 as a veterinary assistant and technician. She then moved to Florida to explore the world of wildlife and emergency care, and became a mother to a bouncing baby boy. 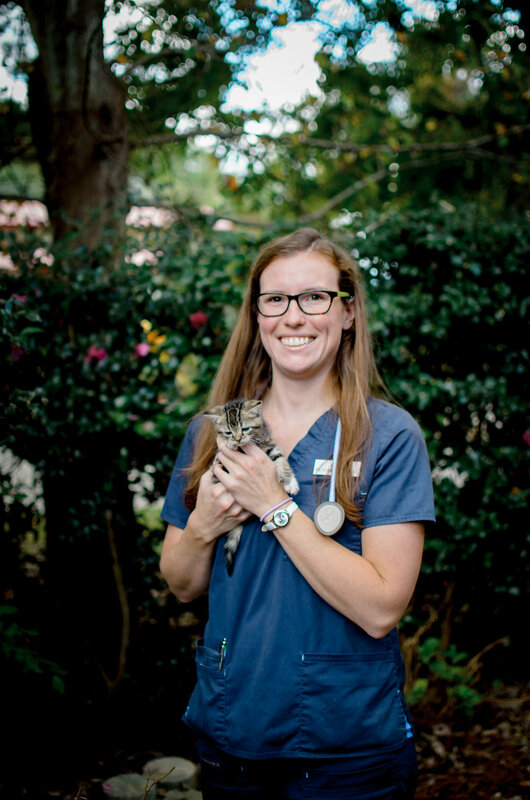 Sarah came back to us in October of 2018 as one of our amazing veterinary nurses. In her free time, Sarah enjoys kayaking, crafting and spending time with her adorable baby, Jackson. Lauren started in September of 2018 as a kennel attendant. She is a born and raised Charleston native. Lauren attended Trident Tech for a year and a half for their Math and Science program and has begun working as a vet assistant. You’ll often find her making sure pets are comfortable during their appointment. In her free time, Lauren loves having spa days and going to the beach with her dog. Lauren came to us in January of 2019. She is from Virginia and moved to Charleston in 2005. Lauren worked in the pathology field for 12 years before making the switch to animal care. She hopes to soon attend Trident Tech for their vet tech program. While she’s not working hard as a care coordinator, Lauren likes to spend time with her son. One dog, Abby, and a cat named Sasha.